La Geria wine region it’s a protected landscape. The black ash from volcanic eruptions, the manual work of man, the unusual cultivation system has led to a unique area, unlike any other in the world. When you drive around the La Geria you are suddenly intrigued by the small walls made of stones, the “soco”, that protect the vine from the strong wind. But when you stop and visit a Bodega, you will discover that there’s much more. Due to the black ash layer, that reach in some areas 3 mt down, the soil is not wet enough to make grapes grow. The system of cultivation in holes of conic shape allows the vine to get to the soil under the dense layer of ashes. It’s all manual labour, there’s no possibility of machinery such as tractors to help here. 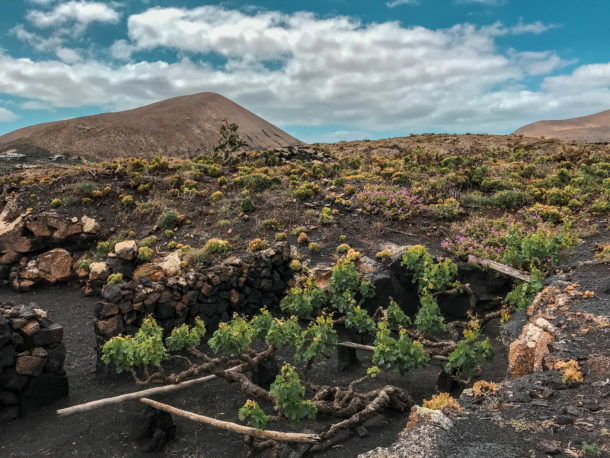 Half day will be enough to the visit of the top 3 winery in Lanzarote and taste the incredible results of the hard manual work and the unique cultivation system. We started from El Grifo , the oldest winery of the Canary Islands and one of the ten oldest in Spain. The logo of El Grifo, the Griffin Bird, was designed by César Manrique. The architect also designed the label of the Malvasía Semidulce Colección … I loved the graphic style so much that I had to buy a poster! 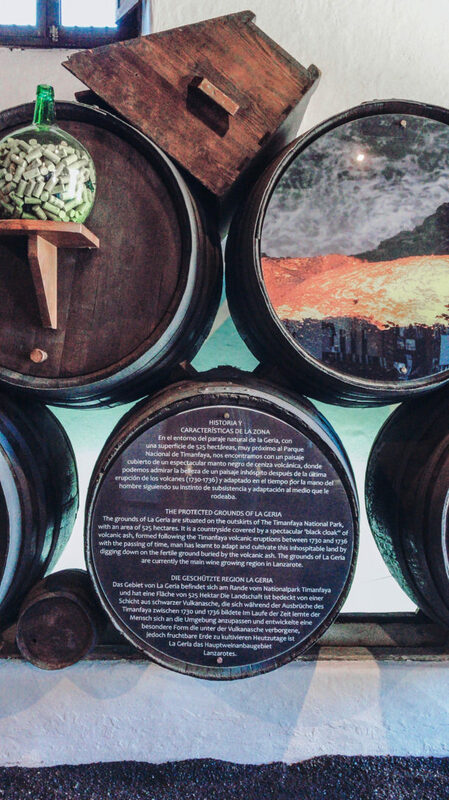 The vineyard and the wine museum are well worth a visit: choose a guided tour (starting from 8€) so that you will discover and understand how wine in Lanzarote is made. Guided tour of the Wine Museum. Old and current cellar, its vineyards, including 2 different wines tasting of our choice. Have a look at the video to know a bit more about the bodega and La Geria region. Of course, after having two tastings at h11.30 we were a bit tipsy, even if Lanzarotenian wines are not that strong. Most of them are young white wines, because the vast majority of production, around 75%, is still dedicated to the Malvasia grape. In need of something to eat we moved to Bodegas Rubicon which has a restaurant and a spectacular terrace overlooking the vineyards and the Timanfaya National park. The Bodegas Rubicon restaurant is located in the oldest rooms of the property where the first lagar was originally built. 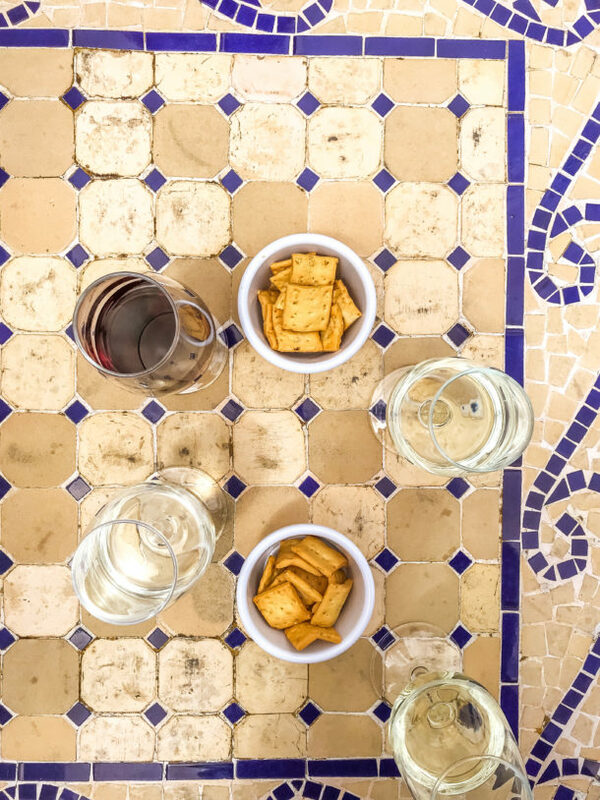 Its architecture and interior design are in the typical Canarian style, which paired perfectly to another white wine and a plated of mixed cheeses&charcuterie and a small dessert. You can also visit the canteen which we didn’t, but whose feedback and review were very positive. I really recommend to stop there for lunch or an aperitif and enjoy the amazing view. Last but not least, straight in front of Bodegas Rubicon, there’s Bodegas La Geria , built in the late nineteenth century by the family Rijo. This canteen got several awards and recognition worldwide, so we decided to buy a couple of white wine bottles to bring them home. There are dry and medium-dry Malvasias, some nice sweet Moscatels, few reds and rosè. You can find also smaller bottles 0,50cl if you don’t have so much space left in your luggage but you still want to bring back the taste of this amazing island. Filed under note di viaggio, travelnotes. 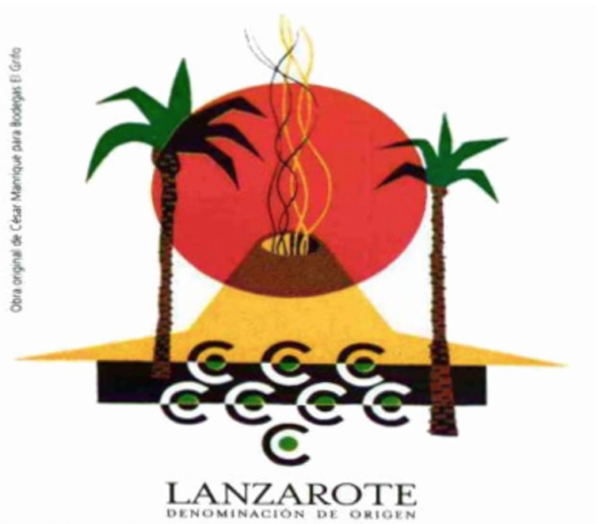 Tagged blog, canary islands, food and drink, lanzarote, localcusine, south lanzarote, wine.